Funeral rites for Bishop Martin N. Lohmuller will take place Wednesday, Feb. 1 at the Cathedral Basilica of SS. Peter and Paul. The bishop’s body will lie in state at the cathedral from 10 a.m. to 1:30 p.m. The Solemn Funeral Mass will begin at 2 p.m. and immediately afterward the Rite of Committal and interment of the body will take place in the cathedral crypt. Read more about the burial place for Philadelphia’s bishops and other clergy here. A live streaming broadcast will be provided by the Philadelphia Archdiocese at archphila.org beginning at 1 p.m.
All the faithful are welcome to attend the Mass or watch the live broadcast using the worship aid booklet for the Mass. 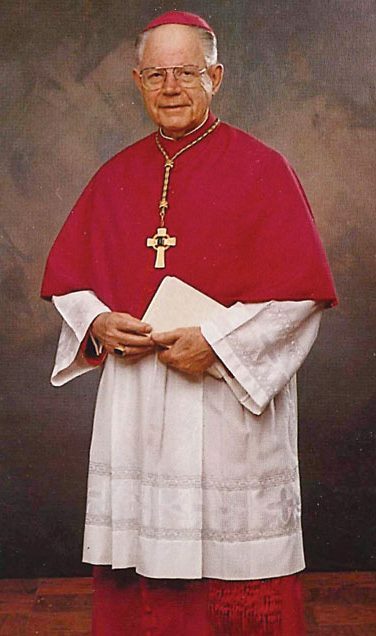 All are invited to offer their prayers in gratitude for the gift of Bishop Lohmuller’s life, for the happy repose of his soul and for all those who mourn his passing. Read CatholicPhilly.com’s extensive obituary on Bishop Lohmuller’s long life and ministry in the Archdiocese of Philadelphia and beyond. A prayer card for Bishop Lohmuller is available here.